Last week we started talking about The Three Pillars of Your Riding Foundation. I explained how the foundation which you are building to support your success as a rider rests firmly upon what I call three pillars. These are: the Pillar of Focus, the Pillar of Fundamentals, and the Pillar of Fitness. The Pillar of Focus is all about your mind-set and applying the power of your attention on a daily basis towards bringing your riding goals to life. Focus also encompasses your ability to keep your attention oriented firmly on what you want, not on what you DON’T want, every moment that you are riding. 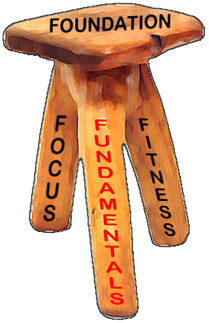 Today we are moving on to the second support for our riding foundation, the Pillar of Fundamentals. Years ago, when I started taking lessons with my first dressage coach, I was very much in awe of all the other riders that trained with her. I just sort of assumed that they were all light-years ahead of me in every way. Over time, however, I observed that everyone was at their own place in their training, and that everyone kind of respected where the others were in their journey. But one student in particular stands out in my memory. This person, let’s call her Dianna, was obsessed with the beauty and elegance of dressage. She had a big beautiful brown horse and her burning desire was to ride floating elegant trot half-passes with him (preferably in a big National Show, while wearing top hat and tails!) Nothing wrong with that, right? Well, here’s the thing. Riding the half-pass so symbolized dressage for her, that she was not satisfied with anything less. Every lesson she took had to include exercises that she could clearly see were part of the development of the half-pass. But, the problem was, she wasn’t ready to ride the half-pass. Not nearly. She couldn’t sit the trot, she couldn’t offer the horse a steady contact, the horse wasn’t connected from back to front, and she wasn’t sitting straight and balanced so the horse was never straight or balanced, either. There was a whole list of missing fundamentals. Every attempt by the coach to steer Dianna back to the basic exercises that she needed to master first, was met by resistance. I watched this battle of wills go on for literally years. Last I saw, she still couldn’t ride a half-pass, and she was still struggling along, no further ahead in her riding than she had been back then. The top hat and tailcoat were still hanging in the back of the closet. Remember this, What you resist, persists. You need to accept where you are in your development, and honour that place by always putting first things first. If you master your fundamentals, the fancier movements, like those half-passes, will eventually drop into your lap like a ripe plum! Sometimes people want to rush past the fundamental work because they think it is boring, or not interesting, or not all that impressive. Nothing could be further from the truth! Personally, I would MUCH rather watch a well-executed Training Level ride, than an over-faced combination struggling with Second Level. I forget who said “The basic work, properly done, is endlessly fascinating,” but those are words to live by. I highlighted the words properly done, because it’s true. When it’s properly done, the quest for perfect practice IS endlessly fascinating, challenging, and ultimately, rewarding! Don’t think it is any different for the top riders either. They don’t spend all day every day practicing movements. They start out every ride with a focus on basic fundamentals, asking the horse throughout the warm-up exercises a series of questions, “Will you go forward?”, “Will you come back?”, “Will you move off this leg?”. The fundamentals of strengthening, suppling, and improving the basic gaits always precedes the fancy stuff. To illustrate the importance of putting first things first, no matter what, let’s take a look at this story, which Courtney King Dye shared in the December 2011 issue of Dressage Today magazine. Some people rush “the basics” in dressage training. Mythilus (her partner at the 2008 Olympics) is a perfect example of why it’s important to focus on them, instead. He came to me having shown Grand Prix twice for a 63 and 64 percent, but when I got on him, I couldn’t do a single flying change. Heck, I couldn’t even do a good trot-to canter transition, much less ones (flying changes of lead every stride). Every day for the first six months, I cried because I felt so incompetent. In all of my sessions with him, I did about a million trot-walk transitions. My mentor, Lendon Gray, was wondering why I did these endlessly, and she eventually got on him and took it down to walk-halt transitions. It took me a year to be able to do a sequence. Even though Myth knew the movements, he could only do them if I held him together, which greatly minimized the quality. By focusing on getting him to listen to me and carry himself and by never doing the movements holding him together in any way (even if the best I could do was a turn on the forehand and walk-halt), in two years we were at the Olympics. To make this happen, I had to go back and work on the basics. The basics allow the horse to move on his own 100 percent and to maximize athleticism. On behalf of all riders everywhere, I want to offer Courtney a deep and sincere thank you, for being willing to be so open and authentic in sharing her experience with us. Nothing could more powerfully illustrate that training isn’t always a bed of roses and a trail of sugar cubes, not even for the top riders. And, that’s a gift really, for all of us. Why? Because she proved that by putting her faith and her focus on the fundamentals, it turned things around and brought this horse and rider to the fore-front of the world stage in what is really a very short period of time. To those fundamentals of Go, Stop, and Steer, I add the first three elements of the training scale: Rhythm, Relaxation, and Contact. These are the horse basics that I work on with every horse that I train, every ride: Go (forward from a light leg aid, first time, every time) Stop (come back with a light half-halt) and Steer (turn promptly and easily off the outside rein), all while maintaining Rhythm (purity of the natural gaits), Relaxation (suppleness or looseness through the body, which comes together with lack of mental tension) and Contact (acceptance of the bridle and seeking contact with the bit). Transitions within and between gaits are the ways that we both test and develop how well the horse has mastered these basics, and through this systematic development the horse builds his self-carriage, not relying on the rider to either hold him up, or hold him together. It goes without saying that the horse can only learn his basics if we have our own basics mastered. The rider fundamentals are the qualities that WE need to have or be working on. The list of rider fundamentals is also refreshingly brief, and just about begins and ends with that holy grail, the independent seat. At it’s heart, the independent seat means you have the ability to blend in seamlessly with the horse’s movements, not disturbing his balance or his ability to move by giving unintended, confusing and conflicting input from your body. It includes the ability to control each of your body parts without affecting any other part of your position. If you are bouncing, or using the reins to keep your balance, this is telling you that you need to work on your seat. Lunge lessons, with and without stirrups, are a great way to teach your body what it needs to know. I like to ride without stirrups at least once a week. Work on tuning your position, ideally with knowledgable eyes on the ground, is something that never ends. Who can forget the pictures of the elegant and effective Reiner Klimke warming up with no stirrups at major Championships? He worked at it. So should we! Your ability to not interefere with your horse’s way of going is a prerequisite to having the ability to actually be able to influence and improve his way of going. The one other fundamental quality for a rider that I would add to this brief list, is that of being clear and consequent, both with your aids and your expectations. This goes back to my ABC principle explained in the articles: The ABC’s of Training: Always Be Clear, and Putting Your Horse in Front of the Leg. Building your Pillar of Fundamentals by strengthening your horse and rider basics is an on-going process. Don’t be afraid to seek out help, guidance and support in your quest. Now in the comments below, tell me your thoughts on the Pillar of Fundamentals, as well as any insights or A-ha’s you may have had while reading this article. I am printing your “Fundamentals” blog for my students. I instruct a 15 yo and a 26 yo; both female. I am constantly reminding them that they MUST practice their basics everytime they visit. I go through a list of questions they need to ask themselves as they are warming up, or things they need to ask their horse. If they are not getting a “yes”, they need more work to get the partnership going. You have written a very nice informative blog. I’m sure it will make an impression on them. Thank you so much for the feedback. I am so glad to hear that you found it useful! I heartily agree. I finally through the years discovered that the horse is only as good as the rider. It isn’t the horses fault as you pointed out. A horse only reflects the rider’s skill or lack of. I found that as I improved my riding, my horse improved. I enjoy the fundamentals, & am thrilled when my Tunix is soft and supple! I don’t care if I get to what some call the “good stuff”. My mind isn’t so good anymore and I doubt if I could remember a test longer than training level tests anyway, Ha! A horse with well trained basics can really help his rider though.